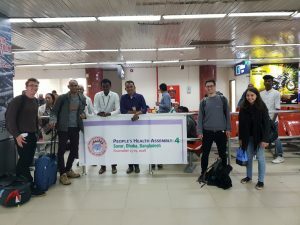 After a 28 hour journey and a further 7 hour wait for our Visas to be processed, PHM-UK have arrived in Dhaka, Bangladesh, 18 years after the first People’s Health Assembly was held here and the subsequent birth of the movement. Despite a protracted stay in Dhaka airport, we counted ourselves some of the lucky ones with other delegates kept overnight and some very unfortunately not being allowed in to the country at all. This sobering news was followed by an email from the conference organisers that due to technical issues the conference venue had been changed and a decision made to start a day later than planned. Whilst the organising committee and PHM Global worked tirelessly behind the scenes, a spontaneous meeting was convened by members from PHM Australia as a meet and greet. 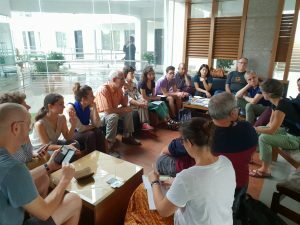 The vision for the meeting quickly evolved as members from all over the world, with the help of a number of translators, came up with ideas to effectively use Day 1 of the conference. A member from Greece captured the spirit of the movement saying that we don’t need a plenary to start the assembly… we have everything we need here as he pointed to the rest of the room. It was decided to use the time to get to know your region, share challenges, ideas and hopes for what people wanted out of PHA 4 and beyond. It’s safe to say that PHM Europe maximised their time by extending a proposed 1 hour meeting to last until dinner. Members from Spain, Italy, Belgium, Greece, Austria, Croatia, France, Germany, Switzerland and the UK shared the struggles of achieving Health for All within their countries. Whilst deep in discussion, it was humbling to look around at different regions in conversation, particularly poignant was the Latin American contingent welcoming in the assembly with a Mayan tradition. 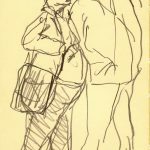 The stories from elsewhere in Europe resonated hugely with common themes coming out surrounding the privatisation of care, a hostile environment towards migrants and efflux of healthcare professionals from the public system. Although sobering to hear the dismantling of health services, it was empowering to hear the voices of those mobilising effectively to combat these and work towards equity in health. Relationships built and lessons learnt will be invaluable to work with PHM both on UK and European levels. Our regional meeting was adjourned for a global football match, and the birth of PHM FC. 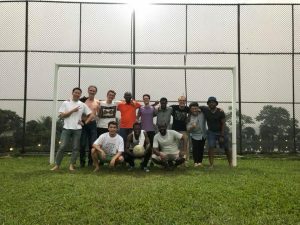 Delegates from Malawi, Benin, Ghana, South Korea, Belgium and Austria joined in to play on the hallowed turf of the BRAC-BCDM pitch. Pol (Pogba) de Vos, deputy director of the Institute for Global Health and Development, was awarded player of the match. After registration it was time for another amazing Bengali curry before some much needed rest to get ready for the exciting official programme to start tomorrow. We are incredibly grateful for the work of the organising committee and PHM Global in what has been an inspiring day to meet and learn from health activists across the world.